The Treat Triad by Kyjen was our first dog puzzle purchase. We were excited about the concept, since our German Sheprador needs quite a bit of mental stimulation. It was a decent toy for the price we paid, but we bought it on sale. The design is pretty simple. It has three chambers to put treats in. Each chamber has a flap door over it and then there is a rotating bar on top. The idea is that the dog will push the bar out of the way of the chambers and then flip the doors open one-by-one to get to the treats. Unfortunately, the toy is made out of a very lightweight plastic. Our dog moves the bar and then flips the whole toy upside down, which causes all of the treats to fall out at once. The first time we let him play with it, I made the mistake of putting in on our hardwood floor. The super-light plastic scraping on our floor was one of the loudest and most awful sounds I’ve ever heard. I’m sure the people in the apartment directly below us didn’t appreciate it either. Now that I know to put a blanket down first, I can tolerate him playing with it. 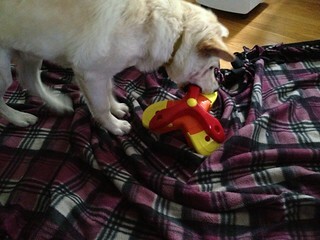 He outsmarted the toy, but I think it might have worked if it was heavier or if there was rubber on the bottom of it. The rubber would also help with how loud this toy can be. It’s a good idea, but it was poorly executed — he never uses it in the way that it was intended to be used.